Recently I have been looking into performance profiling different methods of implementing an Object Factory pattern. Something that can choose an appropriate concrete type and create it when a requested interface is given. A fundamental portion of this is to be able to register types with the factory, and in my case this needs to be done by a xml configuration file. Therefore the type is ultimately created by calling Type.GetType("FullyQualifiedTypeNameHere, AssemblyName"). This has bothered me for some time and I have been waiting until I have time to performance test it. I have an existing Object Factory that can create types when a requested interface is given. You can register a concrete type against an interface either by code or configuration, but mostly this needs to be done by the configuration xml file. 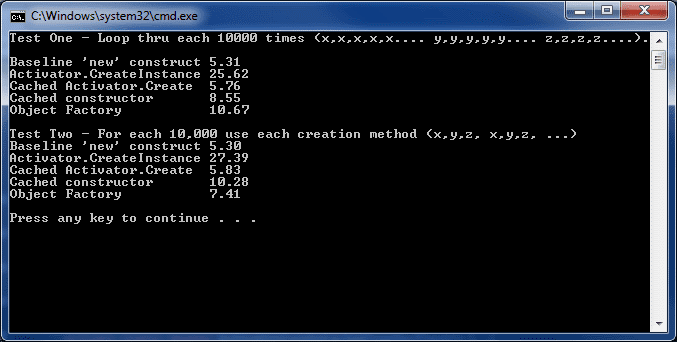 I wrote a test program to time different methods of creating objects and was a little surprised by the results. Let me summerise this code into what I am trying to profile. There are two test sets, each will create 10,000 objects using each technique of creating an object. The first test set creates 10,000 using one technique then moves onto the next technique. The second set creates one object using each technique 10,000 times. This is just to check consistency of the times. The 'new' keyword is used as a baseline control for the test, I wouldn't expect anything to be consistently faster than this. The next test is Activator.CreateInstance(Type.GetType("SomeTypeNameHere")). This I am expecting to be consistently the slowest, as it has to find the type then create an instance of it for each of the 10,000 iterations. This test will use Activator.CreateInstance without refetching the type each iteration (the type is cached into a class level field). This test will simply get a ConstructorInfo object, cache it into a class level field and Invoke for each iteration through the loop. This is my existing object factory. This isn't really a fair comparison as the object factory is doing a little more work than simply creating the object, (like argument preconditions etc) but it shouldn't be a million miles off the others. Its safe to say (despite the slightly high results from run1) that using the 'new' keyword to create an instance of a known type is the fastest, as you would expect. But in second place is Activator.CreateInstance when using an instance of a known Type cached into a class level field. So, because my object factory uses this technique already (with the addition of some checks etc) it is not that far behind. I don't think my existing Object Factory is broken. This proves the cached type when using Activator.Create is not that slow. Considering the alternatives (Reflection.Emit, Dynamic Languages and others) and the complexity they can introduce I think I'll leave it as is. If you can see any serious flaws in this logic let me know.